I read a book a few weeks ago called 299 Days: The Preparation. That book was so bad, it was practically unreadable. 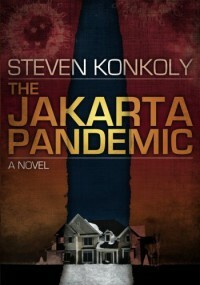 Jakarta Pandemic by Steven Konkoly was the book I wanted 299 Days to be. The story begins by detailing a global flu pandemic and then settles in to describe how this illness affects the neighborhood of the Fletcher family in Portland, Maine. Alex is an ex-marine and has prepared for such emergencies, but many of his neighbors haven't. How will these friends and families deal with things as civilization begins to shut down? In all, I enjoyed the book. Konkoly offers a no-nonsense prose and keeps the narrative simple and straightforward. The only thing that stretched the bounds of credibility was Alex's vegetarianism. A marine sticking to rabbit food? Say it ain't so!